Kiwiana Town | The Kiwiana capital of the world! | What is “Kiwiana”? A small rural King Country town, the official “Kiwiana Town” of New Zealand and hotspot for all things ‘kiwi’. Here we celebrate our national identity with Kiwiana displays of our NZ icons, heroes and traditions. Summer-loving Kiwis uncover their BBQs, scrape off last year’s grime and throw the sausages and meat onto the grill. 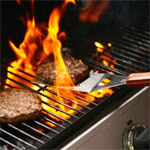 Men are often found standing around the BBQ (for some this is the only time they cook!) with a beer in hand. Once upon a time, wearing a black woolen singlet and a pair of gumboots was an institution among more fashion-conscious kiwi farming males. You could even see them wearing their trusty gumboots and black singlet for an outing to town. The black singlet is warm, covers up the sweat from hard, manual labour and is sleeveless for freer movement. Gumboots are loved by all who encounter mud on the farm or puddles on the footpath. 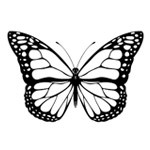 In the 1950s & 60s cut-out painted butterflies were often seen as decorative elements on the road-facing side of traditional, weatherboard, painted houses. If you look hard you can still see some on Kiwi homes today. 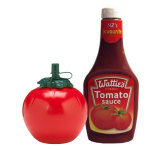 A popular toy and the inspired creation of Auckland brothers, Hector and John Ramsey. 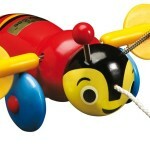 From turning out wooden cores for toilet rolls and wooden doorknobs, Hec Ramsey ventured into toys in the mid 1940s with Buzzy Bee and Mary Lou dolls. With wings that turn and make a clicking noise, Buzzy Bee is a hit with children everywhere and a definite candidate for the Kiwiana Hall of Fame! Over the years Buzzy Bee has endeared itself to millions of Kiwi kids, as well as some famous infants, including Prince William on his first NZ visit in March 1983, when he was nine-months-old. 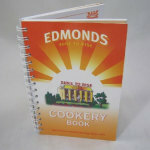 In just about any kitchen in NZ you’re bound to find a wonderfully worn, well thumbed, much floured copy of the ‘Edmonds Sure to Rise Cookbook’. Many a Mum handed her son/daughter one as they walked out the door to venture into flatting life. You can’t get more Kiwi than Fish ‘n Chips from the Fish ‘n Chip shop. Deep-fried fish coated in batter with fried chips as thick as your finger, hurriedly wrapped up steaming in last week’s newspaper. It all cost next to nothing and was found in every NZ town. 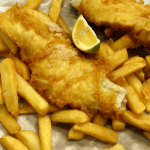 On Friday nights “6 fish and 5 shillings chips” was enough to feed the whole family and half the neighbour’s kids too, spread out on the lounge floor or, as the sun went down, on a sandy beach – nothing tasted better. This was especially so when the tasty morsels were layered between thick slices of white, buttered bread with great dollops of our favourite, Watties Tomato Sauce! Vanilla ice cream with hokey pokey bits in it and a perennial Kiwi favourite. 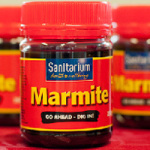 New Zealanders started munching this flavour back in the 1940s. 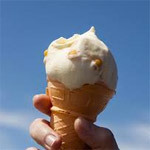 Small pieces of toffee are added to vanilla-flavoured ice cream to create this popular treat. Best enjoyed melting down the sides of a waffle cone on a hot summer’s day! The word ‘jandal’ comes from ‘Japanese sandal’ and became part of Kiwiana in the 1950s. Other countries call these ‘thongs or flip-flops’. Favoured summertime footwear for most New Zealanders, an important part of any Kiwi wardrobe and available in a range of colours, jandals can be worn just about anywhere – from the beach to the pub – they were always a fashion statement on their own. As far as size went, as long as it was bigger than your foot, it was a good fit. 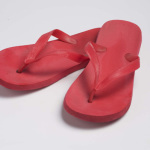 Made entirely from rubber, they lasted for years and only when the thong between the toes broke, was it time to invest in a new pair. Probably the most common Maori greeting, a general expression wishing good fortune and all other good things on the recipient. A fruit that has its origins in China, but is now known as the kiwifruit or ‘Kiwi’ throughout the world. 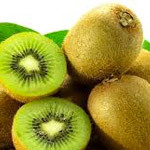 Developed as a modern, less hairy product than its ancestor, larger with distinctive bright green flesh, this “Kiwi” now has a cousin with gold-coloured flesh – known, of course, as “Kiwi Gold”. Short for Lemon and Paeroa. L&P is New Zealand’s iconic soft drink, invented in 1904 after its maker tasted some mineral water near the town of Paeroa and mixed it with lemon to make a particularly refreshing drink. It’s loved by Kiwis everywhere and is still NZ’s most famous soft drink. 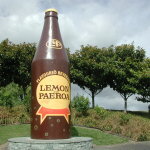 Be sure to visit the giant L&P bottle in Paeroa! A yeast spread that looks like road tar, doesn’t smell that great, but tastes good. Try it thinly spread on toast fingers topped with grated cheese and grilled till the cheese melts – the result: ‘Mouse Traps’ – loved by babies and folk of all ages from there on up! In the 1830s when New Zealand-built ships first began to cross the Tasman to trade with Australia, they did so without the benefit of a national register. Because Customs regulations required trading vessels to have a national ensign some urgency was given to the design of a New Zealand flag. The first design attempt was rejected because it was lacking in red, the colour signifying rank to the Maori people. On 20 March 1834, 30 Maori chiefs gathered and made their choice, a design involving two red crosses on a white background accompanied by four, eight-pointed stars. Known as the “Flag of the Independent Tribes”, this flag flew in New Zealand until 1840, when it was supplanted by the Union Jack. The four stars are the four brightest stars of the Southern Cross. The flag was regularly flown until 1902, when it was officially adopted as the national flag. The Aussies think they invented it, but this is incorrect! 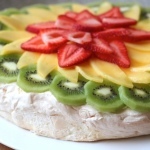 Just as the kiwi is New Zealand’s national bird, the pavlova is the national dessert. Famous Russian ballerina, Anna Pavlova, visited New Zealand in 1926 during an Australasian tour. According to her biographer, whilst Pavlova was in Wellington a hotel chef invented a dish inspired by her tutu, draped in green silk cabbage roses. The Pohutukawa tree (Metrosideros excelsa) is found all over New Zealand, but has a natural growing range north of an invisible line stretching between New Plymouth and Gisborne. 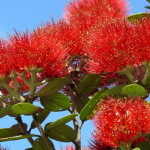 Commonly referred to as “New Zealand’s Christmas Tree”, it flowers around that time of year – its bright red flowers a symbol of summer days ahead. New Zealand’s national sport, and for many almost a religion! If you’re not familiar with the game, then a group of beefy guys chasing an oval-shaped ball around a field might seem rather strange, but nevertheless entertaining. Even if you’re not a huge fan of the game, you will no doubt be familiar with the All Blacks, NZ’s hugely successful national team. Yes! There are more sheep then people in New Zealand. During the early days of New Zealand’s European settlement, sheep were imported to provide meat and wool for clothing. The early pioneers lived “off the sheep’s back”. As farming developed, wool became one of New Zealand’s first export earners. After the introduction of refrigeration in 1886 mutton and lamb were also exported. 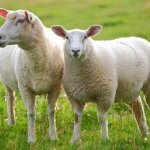 New Zealanders are proud of their sheep, now down to 39 million from 70 million in the 1980s. 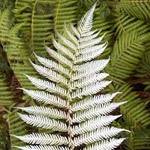 A predominant feature of the New Zealand bush are the ferns; indeed an early colloquial name for the country was ‘Fernland’. The tallest of these is the tree fern (or ponga) and it is the leaf of this species that is one of our best known national symbols. From the very beginnings of European settlement the fern leaf found its way onto newspaper mastheads and into advertising. Later it was incorporated into military and sports badges. The Silver Fern leaf first appeared on the badge of the New Zealand Native Rugby Team that toured Britain in 1888. A silver or white fern design on a black back ground has been used ever since as New Zealand’s sporting emblem. New Zealanders became known as “Kiwis” during the First World War. The nickname was inspired by Kiwi Boot Polish, an Australian product used by New Zealand soldiers in Europe. (The manufacturer’s wife was a New Zealander, so he named it “Kiwi”). The name has stuck ever since. It's on State Highway 3, just 15 minutes north of Waitomo Caves Village. This website is proudly brought to you by the Project Kiwiana team, Otorohanga District Development Board Inc.